My buddy Mike Dolan runs a very cool magazine targeted to professional athletes called Athletes Quaterly. Each issue is loaded with content/interviews about current and former pro athletes. Mike and I are both very big NBA fans, especially from 70-90's eras. 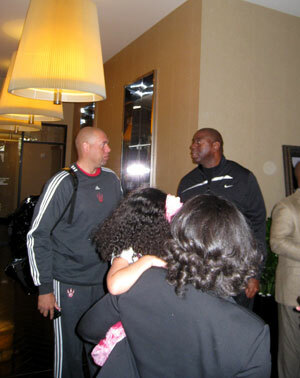 This weekend I had a very cool opportunity to join him in Houston, the host city of the 2013 All Star game. Mike has interviewed or knows various members of the NBA Retired Players Association, so we got to hang out with many of the legends at the Hotel Derek where they were staying. We left for Houston on Wednesday and former Syracuse and Knicks forward John Wallace was on our plane. It was a 4 hour flight to Houston, so I got to listen to the TV on JetBlue while I worked on my laptop. 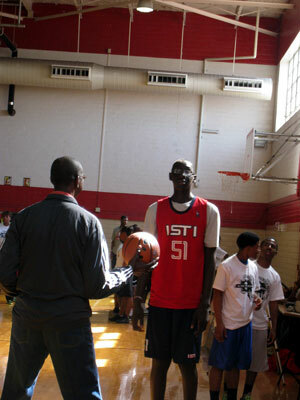 Caldwell Jones is listed at 6'11, and he is schooling a local kid who was at least 4 inches taller. Harvey Catchings and Johnny Egan running drills. After the clinic we came back to the hotel for lunch. We got to eat with Michael Ray Richardson, T.R. Dunn and another big guy we didn't know. There were lots of specials on Michael Jordan's career with his 50th birthday this weekend, and everyone was commenting on how great he was. Moses Malone walked up to the hotel and a woman working at the hotel entrance asked says, "excuse me who are you?" He says in a deep voice, "I am Moses and I am checking in" as he blows by her. She was frozen flabbergasted and a group of players just starting cracking up. Michael Ray was trash talking some player, and Artis yells out "don't let him get in your head. He talks so much stuff". And they both start cracking up. 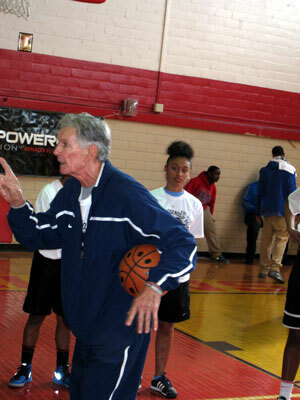 Rick Barry is talking to Mack Calvin. I hear the always opinionated Barry that there should be more ABA in the Hall of Fame. Then he says, "Why is so and so in the Hall of Fame. He was a good college player, but he didn't do S**T in the NBA. I just don't get it." 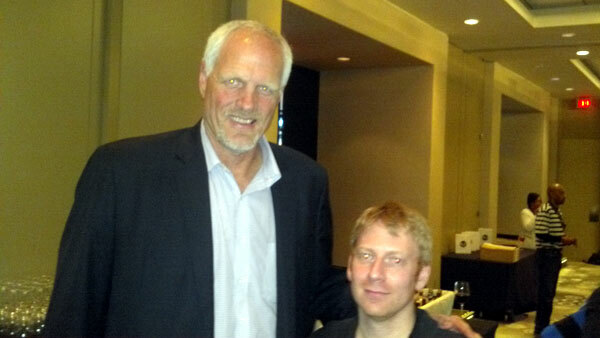 Mark Eaton puts his arm around this other 6'10 big guy I didn't know. He says, "You may not know this, but you are the reason I started working out. You beat me up so bad I had no choice." They both laughed but Eaton was serious. 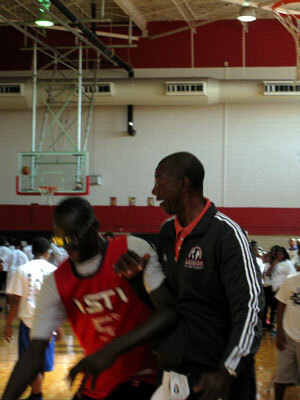 Bob Elliott was telling me how he played in Piscataway, NJ during his days with the Nets. 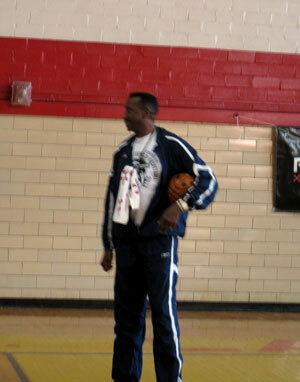 I went to Rutgers so I knew that arena very well, and he said it was the hardest court in the ABA or NBA. It was so brutal that David Thompson refused to play a game on that floor. 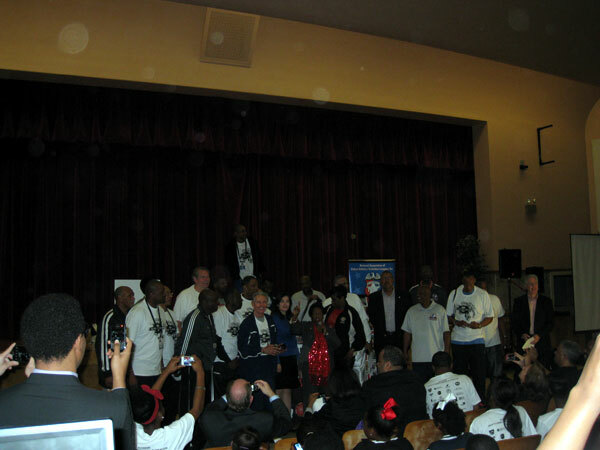 We talked about his days with Maurice Lucas and Mike Newlin. Steve Hayes told a story about his days with the Blazers. When Bill Walton signed with the San Diego Clippers, the Blazers were to get players as compensation (Kevin Kunnert, Randy Smith, Kermit Washington and Mike Gminski). Dr. Jack Ramsey told the team, "everyone is safe, except for you Steve" and Steve Hayes got waived as 3 big guys were coming in. Mike was talking to former NC State and Sonics center Tom Burleson. A guy comes up to Burleson and says, "I punched a guy in the face for you". Burlseon had no idea what who the guy was and didn't remember it... When Mike did the research, he found this article detailing that it was Archie Clark avenging a leg whip on Tom with a punch to the jaw. 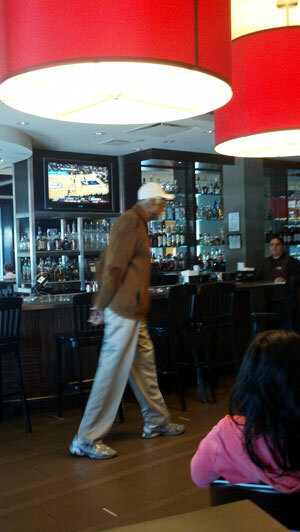 As we were having breakfast on Friday, we saw Bill Russell walking in to eat with Satch Sanders. 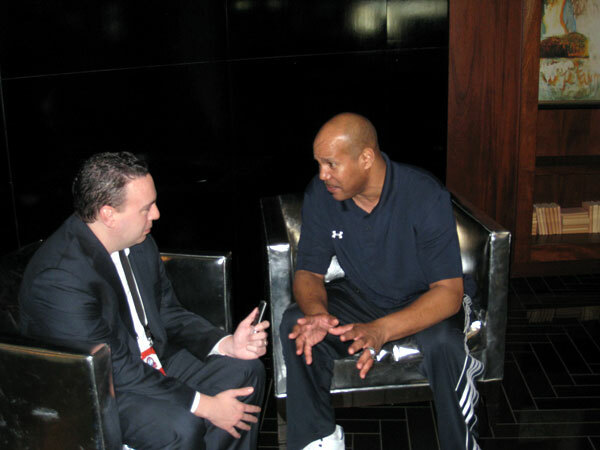 Mike interviewing Bo Kimble. They talked about how Bo is using the Paul Westhead run and gun system for the high school and junior college teams he coaches. 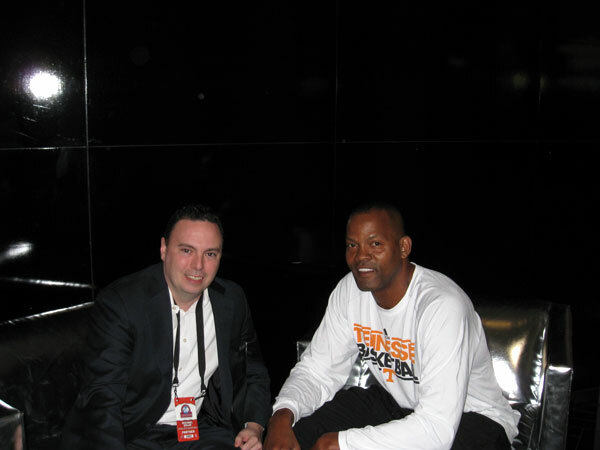 Mike interviewing one of my all time favorite super shooters, Dale Ellis. 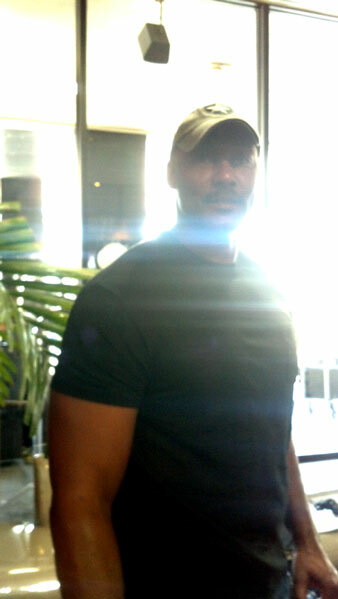 Karl Malone is pretty jacked these days. Tracy Murray and Magic Johnson chatting it up. 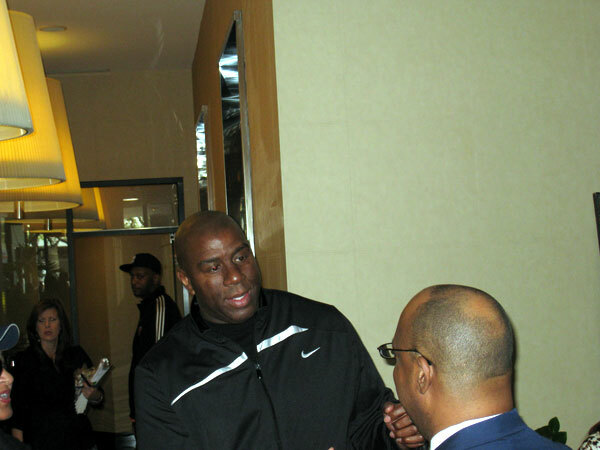 Magic Johnson chasing after Scottie Pippen to say hello.